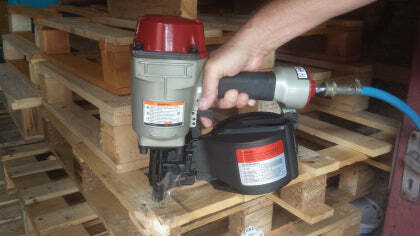 This week we are looking at the air operated CN70 Coil Nailer– ideal for making and repairing pallets, crates, fencing, decking etc. Takes nails 2.3-2.9 in thickness 45mm – 70mm in length. You can see in the video the gaffer (Steve) made a hash of loading the nails – but at least you can see the tool being used…….Obviously I mean the nail gun!! !